It's been a short little while since the Coen Brothers have graced us with their brilliance, but now they're back from hiatus with a new Western anthology movie called The Ballad of Buster Scruggs. Today, Netflix has released the first trailer, letting us in on all the secrets that await this fall. The Ballad of Buster Scruggs is a six-part Western anthology film, a series of tall tales about the American frontier told through the unique and incomparable voice of Joel Coen and Ethan Coen. Each chapter tells a distinct story about the American West. The Ballad of Buster Scruggs is written, produced and directed by Joel Coen & Ethan Coen, with Megan Ellison, Sue Naegle and Robert Graf serving as producers. The cast includes Tyne Daly, James Franco, Brendan Gleeson, Bill Heck, Grainger Hines, Zoe Kazan, Harry Melling, Liam Neeson, Tim Blake Nelson, Jonjo O'Neill, Chelcie Ross, Saul Rubinek, Tom Waits, Clancy Brown, Jefferson Mays, Stephen Root, Willie Watson. The film received the Best Screenplay award at the Venice Film Festival this past weekend. 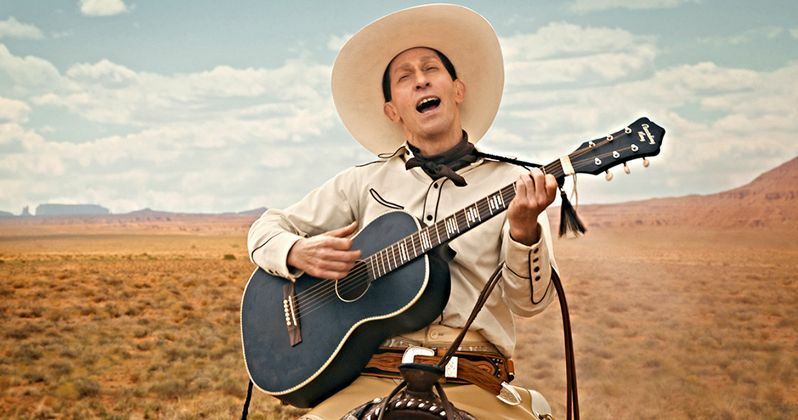 The movie kicks off with the short it's named after, The Ballad of Buster Scruggs, which stars Tim Blake Nelson as the title character, and Willie Watson as The Kid. The second short features James Franco as a Cowboy in Near Algodones. Liam Neeson and Harry Meling team up as Impresario and Artist, respectively, in the their short Meal Ticket. Iconic musician Tom Waits is an old prospector in All Gold Canyon. Thefifth short has the Coen's working with a few actors they've never dealt with before. The short is called The Gal Who Got Rattled, and features Bill Heck as Billy Knapp, Zoe Kazan as Alice Longabaugh, and Grainger Hines as Mr. Arthur. The final short is called The Mortal Remains, and stars Brendan Gleeson as The Irishman alongside Tyne Daly as Lady, Jonjo O'Neill as Englishman, Saul Rubinek as Frenchman and Chelcie Ross as The Trapper. Buster Scruggs started life as an anthology TV show, but each Western themed episode has been whittled down and shaved into the form of a cohesive movie. What you might call binge watching at its most refined. The Coen Brothers' latest is one of three movies Netflix hopes to woo the Oscars with. Buster Scruggs is coming on November 16. Arriving before it is on October 10 is another Netflix Oscar hopeful, 22 July, from Bourne director Paul Greengrass. Coming later on December 14 is the black and white drama Roma, from acclaimed director Alfonso Cuaron. All three have a big shot at winning some awards. You can check out this first look at The Ballad of Buster Scruggs direct from Netflix streaming Youtube channel. It follows Hail, Caesar, their 2016 effort that didn't capture too much acclaim upon it's arrival. Hopefully they will fare better with this TV show turned feature film.